It had been a long treacherous drive. The temperature outside hovered around zero whilst snow flakes danced in the orange glow of the street lamp. She’d waited a long time to meet someone who could whisk her off her feet, someone who could make her heart whole. She turned to face him. He was dark and handsome, small but perfectly formed. He had an air of nonchalance about him which unnerved her. She took a few paces back. As he stepped towards her he could feel his pulse rise. She was beautiful! Her soft milky body sent shivers down his spine. He sensed she was afraid but reached for her anyway. Something stirred deep down in his soul…. he wanted her! OK enough with the Mills and Boone – its RABBITS I’m on about here. The last couple of weeks have been a roller coaster ride of bunny emotions and owner trauma. We’ve had Flopsy almost 8 months now and everything we read suggest that all rabbits should have companionship (preferably another rabbit). We do give her lots of attention but as much as we try, it’s difficult to lick a rabbit’s ear in quite the same way as another rabbit could. So we decided to get her a friend from the RSPCA. On adoption day, L refused to come along for fear she would be tempted to rescue ALL the stray animals. Actually, I this was a cleverly constructed excuse to avoid being manipulated into adopting a puppy or a kitten at the same time. So, on my own, I stroked several abandoned rabbits in my quest to find Flops a suitable companion. I found RALPH! The RSPCA are quite strict about adoption. I had to fill out reams of paper work and undergo a home check to ensure we were responsible owners. During the home visit, Flopsy presented herself well giving the inspector a look-at-me-I’m-so-adorable-and-I’m-obviously-well-looked-after pose. So thankfully, we passed the check with flying colours. The whole process took over a week by which time I was oozing with excitement about bringing Ralph home. Well, we had Ralph for just over a week and I followed all the guidance about introducing them slowly. I had to keep them apart (via a cage) but allow them to be within close proximity so they could get used to the company. 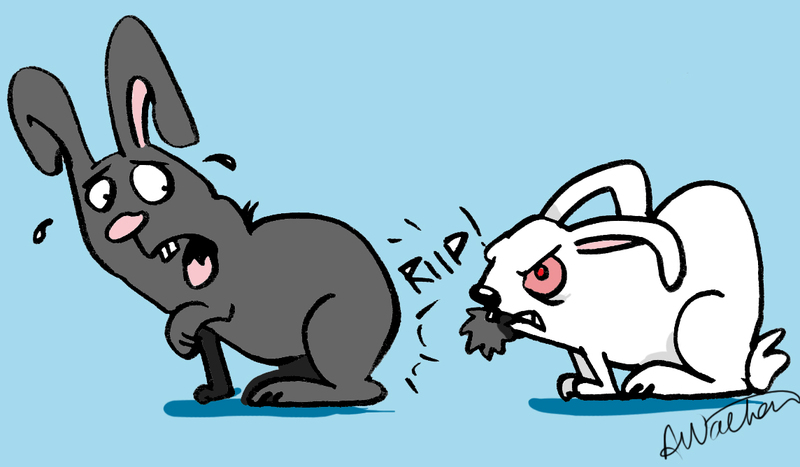 The house became a circus, juggling two rabbits to ensure both of them had plenty of run-around time. Flops was noticeably put out by the situation. She normally has the run of the house but during this time, she kept going off in huff, anywhere that was away from the little black furball. After four days, there were still no signs of friendship- Flopsy scrabbled at Ralph’s cage like a demon possessed and Ralph responded with similar aggression. The rabbit forums assured me “everything would be ok” and to “persist with the process”. I was dubious, but knew it could take several weeks. One day I left them alone in the kitchen, separated by a six foot wire frame. I’d been gone a couple of hours but on my return I noticed things didn’t look right. There were piles of fluff everywhere. When I inspected further, it was obvious an aggressive fight had occurred. One or the other had pulled the frame aside to create a hole just big enough for Ralph (quite small) to squeeze through (Flopsy, taking after her owners, is a little on the chunky side so could never make the great escape). Ralph had ventured into Flopsy’s territory and suffered the consequences. Ralph was rushed to the Vet’s to have the damage assessed – it was nothing short of horrid. His tail had been skinned and all that was left was a bloody stump which had to be amputated. When I recovered from the news of the amputation, I was bowled over by two more bombshells a) the cost and b) RALPH was a GIRL- the RSPCA made a mistake!!! No wonder they didn’t get on. Every single piece of advice given to me before adopting our new rabbit included “don’t put two females together”. Poor Ralph/Rosie would had to spend the night at the vets and endure one week of oral antibiotics! Awwww poor little thing – as soon as she was better we took her back to the RSPCA. Sad story isn’t it, but have no fear everyone… three nights ago, Flopsy, L and I met a Bunny Rescue lady in a car park on the M1 (not by accident, the meeting was arranged). She brought two little boys, Clive and Dooley to meet Flops and under the cover of darkness, we bundled them into the back of her car and let Flopsy decide who she liked best. Clive it was and since then its been a hassle free introduction. Contrary warnings about females becoming aggressive and territorial, Flops has been more than welcoming. I can just imagine her hopping around the house saying in a posh voice “now this is the living room where you can relax in front of the fire and munch on carrot whilst being groomed – just make yourself at home darling”. Clive is still settling in and is already litter trained but he has an unfortunate rabbit-lust for Flopsy. I think she was hoping for some gentle head licking and some warm snuggles but the little guy is mad for it! Apparently, according to the forums, he’s just ‘asserting’ himself… For Flopsy’s sake I hope he calms down – she is looking a little harassed and now sits cleverly with her rear end against a wall or other immovable object. 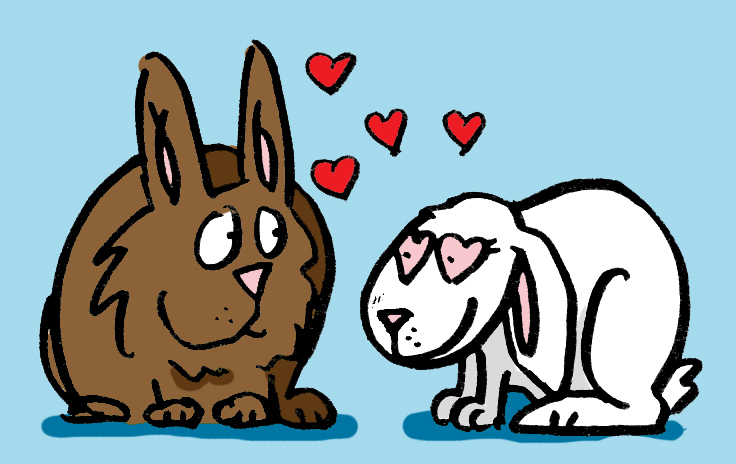 So people, you may not be rabbit lovers or should I say lovers of rabbits…. actually lets just say you might not appreciate rabbits as pets, so I apologise for this post. I must sound like a complete weirdo – probably worse than a dog lover – but I do think there’s a moral to this story somewhere. Let me think… or maybe you could suggest one! This entry was posted in Animals, Rabbits by bighair63. Bookmark the permalink.